Project Recover’s mission statement and core values are the foundation of how our team operates. Interested in doing field work or research with us?, First read this page completely then, contact us here to begin the process. 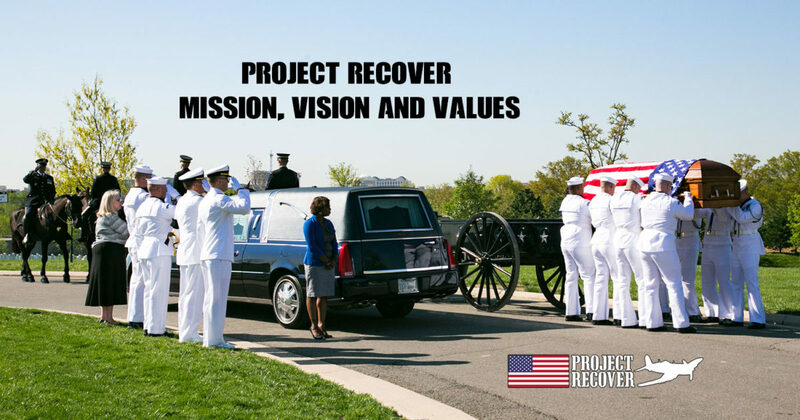 Project Recover’s vision is: (i) to repatriate every American service member who has not come home through research, searches, recoveries and other methodologies; (ii) to provide information and closure to the families of service members; (iii) to provide a platform to educate the public on the importance of service to one’s country; and (iv) to provide unique educational opportunities in the areas of science, technology, history, leadership, public service and diplomacy to a committed student audience, in conjunction with Project Recover’s mission, in order to provide a real world application to students and further educate the public. Project Recover is a collaborative effort to enlist 21st century science and technology in a quest to find and repatriate Americans missing in action since World War II, in order to provide recognition and closure for families and the Nation. Project Recover is dedicated to searching for and locating American MIAs and POWs from conflicts around the world. Project Recover seeks to provide recognition, information and closure to families of these service members who have paid the ultimate sacrifice for our freedoms. More broadly, Project Recover provides a platform for educating the public about critical historical events, lost heroes who shaped our country, and the importance of public service. Project Recover is dedicated to ensuring safety, both in planning and in execution of each and every mission and will suspend an operation if it perceives a safety issue or a potential harm to those assisting in its mission. Project Recover recognizes that leadership is essential and strives to promote leadership as part of every mission experience. Project Recover is committed to fostering a culture focused on respect for the MIAs and POWs and their families, for those involved in its missions, and for the cultures with whom Project Recover interacts. Project Recover recognizes that respect encompasses all aspects of its missions, including such things as privacy, property, the need for information, differences in outlook and backgrounds, laws and traditions. Project Recover’s effectiveness is rooted in the understanding that Americans have paid the ultimate sacrifice in defense of our country. Project Recover focuses on our MIAs and POWs and their families and is humbled by the privilege of working in other countries to carry out this mission. Project Recover values integrity, which is the integration of honesty with reality. Integrity is fundamental to Project Recover’s success, and thus Project Recover encourages individuals to recognize and correct their mistakes expeditiously, privately and when appropriate publicly. Project Recover recognizes that individuals, MIA families and others can and will be affected by its actions and mission. Project Recover is committed to anticipating, as much in advance as practical, the ramifications of its missions and accepting the responsibility to visualize the second and third order effects of its actions all the way to the national and world level. Project Recover acknowledges that its mission must be carried out with rigor, diligence and perseverance. These overlapping values create an obligation to approach, investigate, study, search and prepare for and follow through with each mission using all practical tools to increase productivity. Project Recover either accepts each mission fully or not at all, because the MIAs and POWs and their families deserve Project Recover’s best efforts. This leads to an obligation to continually improve upon Project Recover’s knowledge and success while constantly re-evaluating the approaches, methodologies and techniques that are employed. Project Recover endeavors to be resourceful in maximizing its use of technologies, records, personal recollections and expertise, and whatever else is needed to accomplish our mission. Project Recover encourages thinking ‘outside the box’. Project Recover promotes and encourages learning from others’ experiences, knowledge, accomplishments and talents. Project Recover is committed to sharing its information and discoveries with families, agencies and others, while protecting personal privacy and confidentiality. Project Recover chooses individuals and entities to team up with, based on their character, trustworthiness, and added value to its mission. Once such people and entities have been selected they are deemed to be worthy of trust in accepting and carrying out Project Recover’s mission. Project Recover’s mission is somber, for which we are respectful and our services are provided with joy and compassion These separate but overlapping values provide continuity and humanity to Project Recover’s mission. Project Recover recognizes that while our mission is focused, we remain flexible, responding as appropriate to emerging data.